Adult fruit flies are 1/8-inch long and have a dull, yellow-brown to dark brown color. Some species have distinctive red eyes. The larvae are small (1/10-to 1/5-inch long) and very distinctive with an extended, stalk-like breathing tube at the rear end of the body. Fruit flies are common structural pests, frequently associated with fermenting fruits and vegetable or excess moisture. Recycling bins and their contents, as well as fruit and salad bars, are ideal habitats and have resulted in increased problems with this pest fly. 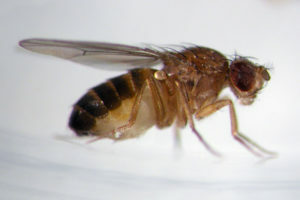 Fruit flies are best controlled by finding and eliminating the breeding material. Complete and thorough sanitation is necessary to eliminate the source of the infestation. Insect light traps and baited jar traps, fitted with tops which permit entry and prevent escape, are effective in reducing the population but are no substitute for sanitation. There is no effective means of control for the larval stage of the cluster fly because they develop in earthworms. 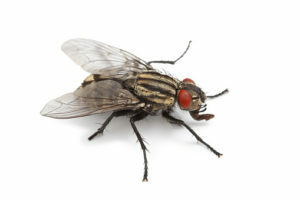 Large accumulations of these flies can be removed with a vacuum cleaner. Insect light traps can also be placed in attics but require frequent service. Since cluster flies can not be controlled by disrupting the life cycle of the larvae, it is recommended to contact pest control for treatment. Blow/bottle flies range in size, varying from ¼ – ½ inch. 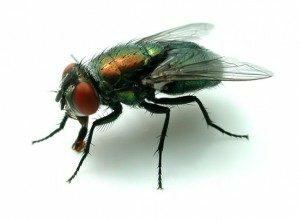 The black blowfly’s coloring is black with a bluish green luster; the green bottle flies is a metallic blue-green, and the blue bottle fly is a metallic blue.